Even if the cost of the nation's worst oil spill rises to $70 billion, the high end of current estimates, BP's pockets probably are deep enough to withstand it. But much depends on what costs are included in the final tally, and who else might end up sharing the liability. BP says it already has spent $1.6 billion on the spill response and related claims. Estimates for the company's future costs and liabilities are are all over the map. Analysts at Credit Suisse last week estimated the spill would end up costing the company $37 billion, while Goldman Sachs said a "reasonable worst-case scenario" could bring the tab to $60 billion or $70 billion. With oil still gushing from the blown-out well, the total extent of the damage is unknowable. That is one reason the company's share price has been hammered since a rig explosion opened the underwater gusher April 20. BP's market capitalization has fallen by $90 billion or about 50 percent. BP, which has generated more than $100 billion in profits over the past five years, appears to have the financial strength to withstand virtually any scenario. Yet the possibility of a bankruptcy filing cannot be ruled out if the company finds that the best way to protect its assets, experts say. The company also is considering suspending or deferring its $2.6 billion quarterly dividend, in part to quell mounting outrage over the spill and to ensure it has extra resources to handle claims. The money might be paid into a fund the White House is trying to establish to pay spill-related claims. As far as liability related to the spill, compensation for fishing and tourism-related business may be only the beginning. Some local governments are pressing for lost tax revenues, too. 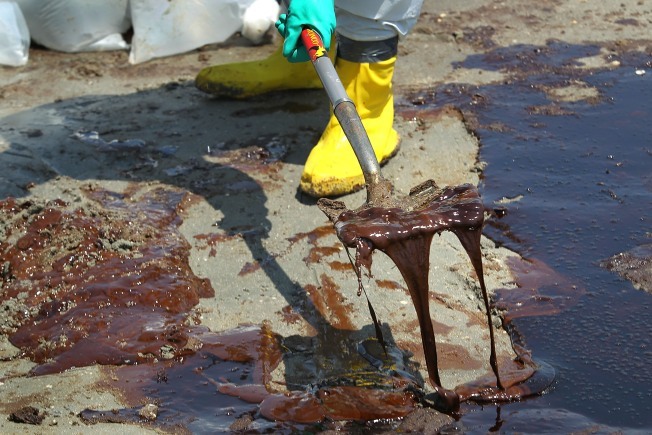 Damage to Gulf Coast tourism, fishing and other industries will depend on how much more oil washes ashore. Ocean scientists say it will take years, if not decades, to determine damage to the Gulf's wildlife. And the White House has suggested that BP may be on the hook for lost wages from drills shut down by the government-imposed drilling moratorium. The halt could cost the drilling industry — and local economies — $4 billion, according to analyst J. David Anderson of JPMorgan. BP is a money-making machine that reported profits of $16.8 billion last year on revenue of nearly $250 billion. The company pumps some 4 million barrels of crude oil from the earth daily, and generates billions in profits from its refining operations. BP also holds $6.8 billion in cash and short-term investments, which it could tap to pay for Gulf spill expenses. But that number is dwarfed by the rest of the company’s financial resources. Even if all of BP’s future profits went to pay for the Gulf spill, the company still owns vast resources of oil reserves that could be converted into cash by selling them to another oil company. According to estimates from bond rating agency Moody’s, BP has total proven reserves of roughly 18 billion barrels of oil in the ground, worth some $1.35 trillion at the current price of $75 a barrel. It also has a string of new fields due to move into production over the next few years, including other wells in the Gulf, along with finds in Azerbaijan, Angola, Egypt and Indonesia. All those wells will provide a steady stream of cash that can help defray the cost of the spill. Even oil recovered from the runaway well could help fund the cleanup. On Monday, Coast Guard Adm. Thad Allen told reporters BP should be able to recover 28,000 barrels of spilled oil per day by the end of this week. At $75 a barrel, that works out to more than $2 million a day. Given the scope of the damage, the complexity of the clean-up and the likelihood of extended legal wrangling over claims, BP will likely be paying over many years, which would ease the financial burden on the company. The legal battle over claims from the Exxon Valdez spill, previously the nation's worst, dragged on for two decades. In the end the Supreme Court overturned a $5 billion jury award for punitive damages, reducing the ultimate payout to about $500 million. And BP may not have to shoulder the entire cost of the disaster. Lawyers filing claims on behalf of victims say liability may also fall to Transocean, which operated the rig; Halliburton, which oversaw the cementing of the well; and Cameron International, which manufactured the failed “blowout preventor.” Shared liability issues likely be the subject of legal battles over contracts BP signed with partners and subcontractors. Early in the disaster BP CEO Tony Hayward hinted at the company's legal strategy when he said the blowout was "not our accident." But Larry Dickerson, CEO of Diamond Offshore, one of the world's biggest drilling contractors, said it would be unusual for the rig operator to accept such liability. Liability could also be shared by BP partners Anadarko Petroleum Corp., which owns 25 percent of the leaking Gulf well, and Mitsui, which owns 10 percent. For now, the threat of a BP bankruptcy for financial reasons seems unlikely but can’t be ruled out completely. If a court awarded punitive damages or the government levied enormous fines, it is possible the company’s cash could be depleted. A criminal conviction could imperil the company’s ability to borrow or disqualify it from signing new oil leases. That may be one reason the Obama administration is pressing BP to set up a multibillion-dollar fund that could be used to pay claims. A spokesman Monday said the White House was “confident” the plan would go forward but declined to say how big the fund would be. Such a fund likely would be independently run and beyond the reach of a bankruptcy judge. BP’s upcoming shareholder dividend could be used as a down payment. Every three months, BP pays its shareholders a quarterly dividend of about $2.6 billion, or $10.5 billion a year. The company's board of directors met Monday to consider deferring or suspending its next dividend and putting the money in escrow toward claims and cleanup costs. That could spark a lawsuit from shareholders, just one more cost for BP.